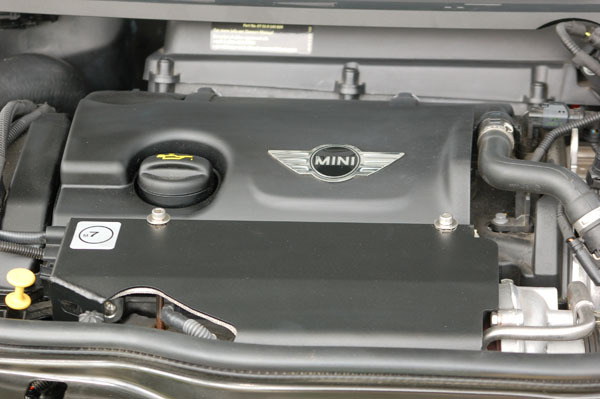 Now redesigned for the 2011+ MINI with N18 engine, the M7 Aerogel Turbo Heatshield for R55 R56 R57 M7 Aerogel Turbo Heatshield for 2011+ N18 engine powered R55 R56 R57 R58 R59 MINI Cooper S Turbo is designed to fit the stock turbo using the two mounting points. It's lined with Aerogel blanket material. The theory is it's meant to minimize the heat flowing to the rest of the engine bay. We have test fitted and found this WILL work with the DDM works Full race intake duct. WMW advises that this product does not fit near as well as pictured, please be advised as you can NOT return it for that reason. Call us if you have questions about the fitment. Fits great! Not picture perfect but it looks like it belongs there. Keeps the heat way down.